Today People Need People becomes Higher Growth Search, a staffing and HR services firm for the cannabis industry. For years, cannabis-based businesses comprised a small and unregulated industry, and there was therefore little need for attention to compliance and employment regulations. However, with the legalization of cannabis came both a flood of new talent into and an increased spotlight on the industry, and many cannabis businesses need outside guidance to keep up with these new demands. People Need People was founded in 2017 in Oakland, CA by Stacy Bryant, an industry veteran who began her expansive career in the industry at the age of 16. People Need People was built as a boutique staffing company geared towards the cannabis industry, and it expanded across Northern California, maintaining relationships with some of today’s most well-known brands. Higher Growth Search’s vision is to help legitimize the cannabis industry by giving businesses resources to manage and care for their employees, institute and maintain safe workplaces, and find and retain the right talent for each role and company. Drawing from experience in helping businesses of all sizes, from startups to large enterprises and across nearly every industry represented in California for the last 50 years, Higher Growth Search brings a wealth of knowledge and support to the cannabis industry. Higher Growth Search also has deep knowledge of the local job markets and a wide network of highly talented workers, along with experience staffing for the wine, beer and spirit fields and other highly regulated industries, making this new company a strong presence as it enters the cannabis industry. 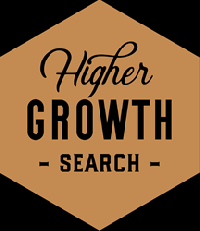 To learn more about Higher Growth Search, visit highergrowthsearch.com. With nearly fifty years’ experience in the staffing, HR, and payroll space, as well as years of working directly with cannabis-focused companies, Higher Growth Search is the foundation on which businesses in the cannabis industry grow. We relieve you of the burden of providing payroll administration, compliance, staffing, and human resources services and apply our deeply-rooted expertise with HR processes and management across industries to your business. Visit highergrowthsearch.com for more information. Students from around the world enroll in Language On's Intensive English Course in Orlando and Vacation English Course. Language On's English school in Orlando is located at 2448 Sand Lake Road and is open daily on weekdays. In less than two weeks, on May 1, prospective college freshmen all over the country will have to make a decision about where they will enroll next fall. But before students make their College Decision Day selection, many will need to consider and compare financial aid offers from different schools. This can be an exciting but stressful time for families as they weigh which school best fits their student’s needs academically and socially against which school is the best fit for their family from a financial standpoint. One of the biggest factors in choosing a college is cost, but comparing financial aid award notifications can sometimes be difficult because different schools have different resources, so financial aid offers—and the way they are presented—can vary greatly. 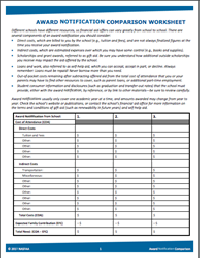 The National Association of Student Financial Aid Administrators has developed an Award Notification Comparison Worksheet that students can utilize to help make the process of reviewing financial aid award offers a bit simpler. The worksheet includes a glossary of terms commonly found in award notifications and provides tips students can follow when comparing financial aid offers. NASFAA encourages prospective students and parents to reach out to financial aid offices at potential schools with any lingering questions. To request an interview with a NASFAA spokesperson about what students and parents should take into consideration when making their college-going decisions, please email powerse@nasfaa.org or call (202) 785-6959. The National Association of Student Financial Aid Administrators (NASFAA) is a nonprofit membership organization that represents more than 28,000 financial aid professionals at nearly 3,000 colleges, universities, and career schools across the country. NASFAA member institutions serve nine out of every ten undergraduates in the United States. Based in Washington, D.C., NASFAA is the only national association with a primary focus on student aid legislation, regulatory analysis, and training for financial aid administrators. For more information, visit http://www.nasfaa.org. Capstone Development Partners (“Capstone”) announced that the New Residence and Dining Hall at the University of Massachusetts Boston, was awarded the Best Public-Private Partnership Development at the Student Housing Business Ninth Annual Innovator Awards ceremony held April 11th in Austin, TX. The project was selected among 115 student housing development nominees encompassing a total of 23 award categories. The project was judged on multiple criteria including: how it solved a unique need for the university; served as a win-win-win for the school, its residents in the project and the developer; building architecture; design into the campus fabric; and the project’s performance relative to budget and schedule. Blue Pillar, the leading Internet of Things (IoT) network solutions provider for facility-based data and control systems, today announced the launch of its Building Blocks Partnership Program (“BBPP”) with over 30 new members. The breadth and size of the partnership program makes it one of the largest IoT partnership programs in the market. Blue Pillar’s partners offer market leading IoT technology, system enablement, deployment, consulting, and value-added applications and services, which complement Blue Pillar’s ability to build and operate best-in-class, facility-based IoT networks via their award-winning Aurora® connectivity and control platform. The combined, fully integrated end-to-end solutions created by these partnerships will provide Commercial and Industrial (“C&I”) facility operators with lower cost IoT networking options and unprecedented flexibility in how their facility information can be leveraged to make them more efficient, resilient, and sustainable. The Family Firm Institute, Inc. has granted certificates in Family Business Advising (CFBA), Family Wealth Advising (CFWA), and Advanced Certificates in Family Business Advising (ACFBA) to a distinguished group of professionals in the family enterprise field. The FFI Global Education Network http://www.ffigen.org/curriculum has been developed by The Family Firm Institute, Inc., and is the gold standard educational program for advisors and consultants working with families in business and families of wealth. The program benefits both family business advisors and their clients by establishing and providing objective and research-based professional standards for advisors to family-owned enterprises and families of wealth. The following students received Certificates in Family Business Advising (CFBA), Family Wealth Advising (CFWA), and Advanced Certificates in Family Business Advising (ACFBA) in the first quarter of 2019. Built for busy professionals, FFI GEN (http://www.ffigen.org/) delivers world-class curriculum, unparalleled access to faculty and thought leaders, and connections to a global network of specialists in the field. Time is running out to register for the Urgency of Civility—A Springboard for Action conference. Held at the majestic George Washington Masonic National Memorial in Alexandria, VA April 30—May 1, this hands-on summit will bring together organizations and individuals who are all working to restore civility in society. A reenactment of President Washington’s first inauguration will set the stage for probing discussion and innovative training with the objective of providing the resources needed to stem the tide of incivility. Government – How does incivility manifest in government and politics, national, state, and local? How does incivility impede all peoples’ voices from being heard, and make it more difficult to reach common ground? Are there any positive signs that civility can re-emerge? We will explore what various actors – elected officials, government employees, and citizens – can do and are already doing to promote civility. Workplace – How does incivility manifest in workplaces? How is it experienced by customers, employees, managers, and executives? Who are the perpetrators, targets, and bystanders in acts of incivility? This track will explore what anyone affected by incivility in the workplace can do to increase civility in workplace relationships. Communities – How does incivility manifest in communities? What are the signs of incivility? What are practices that encourage civility to increase? We will explore what various community actors, including civic organizations, religious organizations, community organizations, and individuals can do to counter incivility and defend and increase civility. Media (social and public) – Social media platforms and news media organizations are frequently accused of furthering incivility, by promoting, publicizing, even profiting from it. What needs to change, and how to make this occur? What are the incentives and disincentives to their doing so? What actions are social media and journalism taking to help civility stage a comeback? 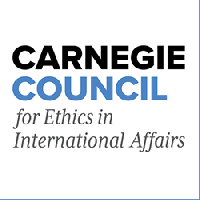 This track will explore the possibilities for what roles these vital institutions can play, and how all of us can be wise consumers as well as advocates for increased civility. Education – How does incivility show up in schools – elementary, middle, and high schools – and on college and university campuses? What are schools and colleges/universities doing to teach and practice civility at each of these levels? Are they doing less than they used to? What more needs to be done? We will explore the roles that educators, educational administrators, parents, and of course students themselves play and can play to strengthen civility. Families and Youth – Does civility begin at home, and start in childhood? Certainly, habits of behavior, how to treat others, and how to discuss and resolve conflicts are all begun early. What can family members, especially parents, do to raise children who are thoughtful problem-solvers and engaged citizens? Do families need help in doing this from other institutions in society? 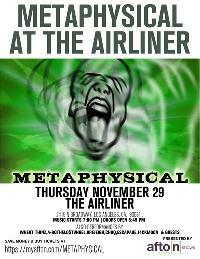 This track will explore the critical role played by families and youth in creating a society characterized by civility. Among the highlights of the conference will be honoring the Father of Civility, Dr. PM Forni as a Civility Pioneer. Register today at Civility--A Springboard for Action. Single-day and student rates are available. We are pleased to announce that Dr. Pradeep Ganguly, the Founder and CEO of MKK-USA, has won the “2019 “Hall of Fame” award from the Maryland Economic Development Association (MEDA: www.medamd.com). MEDA is a highly respected and economic development organization of Maryland, USA. All EDOs, business leaders, consultants and economic development professionals belong to this state-wide organization. Dr. Ganguly is the only Indian-American in Maryland and the Washington, DC region of USA to have been bestowed this high recognition and honor. The award will be presented to Dr. Ganguly on April 29, 2019 during the Annual Convention of MEDA to be held at the Hyatt Chesapeake Resort in Cambridge, MD. Our heartiest congratulations to Dr. Ganguly, with best wishes for continued success. The non-profit Foundation was established in 2015 and is funded by participating association MidAtlantic Farm Credit. The Farm Credit Foundation for Agricultural Advancement’s scholarship program awards scholarships valued at ,000 to high school seniors or students currently enrolled in an advanced educational program. The applicants must be planning to pursue a career in agriculture and reside in a county within MidAtlantic Farm Credit’s five-state territory. The Farm Credit Foundation for Agricultural Advancement is a M non-profit foundation formed in 2015, created to help advance the future of agriculture. The Foundation’s scholarship program is open to all students residing in MidAtlantic Farm Credit’s five-state territory who fit the eligibility requirements. The scholarship program was announced as part of Farm Credit’s 100th anniversary, held in 2016.
mStoner, Inc., and the Council for Advancement and Support of Education (CASE) announce the release of a white paper, Benchmarking Digital Advancement. The white paper, based on interviews and a survey conducted in 2018, reflects how advancement tools, practices, and attitudes are evolving toward integrated, digitally enabled outreach and engagement for colleges and universities with their key stakeholders such as alumni, donors, parents, and others. The 2018 research builds on a decade of other surveys focusing on the use of social media and other digital fundraising and outreach tactics and strategies. “Communications and marketing activities that support the work of advancement are key to an ‘integrated advancement function.’ CASE is pleased to once again have partnered with mStoner on this type of research, part of our overall AMAtlas initiative,” said Fred Weiss, chief research and data officer at CASE. The survey of digital advancement focused on how schools, colleges and universities use various digital tools and techniques in alumni relations, communications, fundraising, and marketing. The white paper explores how higher ed is adopting various digital tools and integrating them into advancement more broadly. In addition to questions exploring how colleges and universities used social and digital media and other tools in their advancement activities, mStoner and CASE researched: the reporting relationships of the chief marketing officer (CMO) and chief advancement officer (CAO); how institutional brands and campaign brands related; and which teams were responsible for important activities such as meeting enrollment goals and engaging alumni and donors. 60 percent of institution's CMOs and CAOs report to the CEO. At 21 percent of institutions, the person acting as CMO reports to the CAO, and at 17 percent of institutions, there’s another reporting structure in place. At 2 percent of institutions, the CAO reports to the CMO. 57 percent of institutions report that they have one or more staff members who manage social media. 65 percent of respondents say they are "somewhat successful" at using social media to achieve their goals. 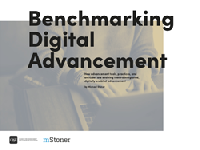 The white paper identifies benchmarks for overall characteristics and specific behaviors that indicate how institutions are progressing on adopting various components of digital advancement. For example, while 67 percent of respondents indicated that their institutions have experimented with digitally powered fundraising such as crowdsourcing or Giving Days, only 26 percent of respondents said that their institution was using a scoring system for alumni and donors — a form of “net promoter” scoring. mStoner, Inc. is a digital-first agency committed to tailored solutions that deliver real results. We craft powerful, tailored, human-centric experiences to illuminate your brand and allow you to tell the story only you can tell. We connect you with the right audience at the right time so you can form right-fit relationships. We position your team for improved productivity, sustainable growth, internal alignment, and proof-positive success. And we aim to make your job fun again and help you create inspired work that you are proud to show off. Since 2001, we’ve worked with more than 350 colleges, universities, and professional schools in the U.S. and abroad. For much more, visit our website at mStoner.com. The Council for Advancement and Support of Education (CASE) is a professional association serving educational institutions and the advancement professionals who work on their behalf in alumni relations, communications, development, marketing and allied areas. CASE helps its members build stronger relationships with their alumni and donors, raise funds for campus projects, produce recruitment materials, market their institutions to prospective students, diversify the profession, and foster public support of education. Tune in to History Channel on Monday, April 1, 2019 @6:30 am ET for an all-new episode of Innovations with Ed Begley, Jr. Check your local listings for more information. Coming up on Innovations, learn about Maryland Environmental Service (MES). Operating approximately 1,000 environmental projects and services across the Mid-Atlantic Region, MES employs over 800 teammates. The show will educate audiences on how MES benefits Maryland’s environment through innovative solutions to the region’s most complex environmental challenges. Focusing on Rivion’s dedicated team of professionals –and its holistic approach to sustainable design, planning, and building– this segment will discover how Rivion employs the latest technologies and methods to uncover issues and challenges. In addition, spectators will see how Rivion uses data driven metrics to make sure it delivers the right solution and drives value for its clients. The Trium Group, a leading management consultancy that specializes in breakthrough business performance, today announced a successful Dialogues on the Future of Leadership: Bridging the Divide event on February 26. The one-day workshop was held at Mr. C Hotel in Beverly Hills, California and included executives from across entertainment, gaming, healthcare, and technology sectors – as well as a cross-section of general managers, human resources executives, diversity, equity and inclusion specialists, and thought leaders from the local community. The event featured world renowned speaker Byron Katie, who addressed the dynamics and challenges of leading in today’s environment by guiding delegates through a powerful inquiry process designed to strengthen one’s clarity and connection in the midst of even the most divisive situations. Through authentic dialogues and an introspective approach, Katie provided attendees with tools, practices, and an awareness of how to create meaningful change from the inside out. The event was opened by educator and TED speaker, Eldra Jackson,who spoke vulnerably about hitting rock bottom during his 24 years in the California state prison system, and the steps he took to confront his belief system of “toxic masculinity.” His journey of self-awareness and transformation not only led to being granted freedom from a life sentence; his life’s work now includes actively supporting others – both within and outside of prison – in overcoming their limiting beliefs. To learn more about this event or other areas impacting human performance and leadership development, contact Trium. The Trium Group is in the breakthroughs business. Founded in 1998, Trium is a leading management consulting firm that seeks to understand and address the human dynamics that impact performance at the individual, team, and organizational levels. Trium has provided consulting and coaching to leadership teams at some of the world’s most recognized companies, including Dropbox, Genentech, Cisco, Sephora, Disney, Paramount Pictures, Sony Pictures Entertainment, Activision Blizzard, and more.With a mission of changing the world by changing the way business leaders think, Trium works side-by-side with clients to enable them to succeed in the white space of opportunity. The Lawn Care Experts at Giroud Tree and Lawn have been carefully planning the official start of the lawn treatment season because the 2018-2019 winter was the wettest on record. A later start will yield better results for homeowners’ lawns and Giroud Tree and Lawn shares the reasons why it’s better to delay a lawn care treatment program. The birds are chirping and the days are longer, which can only mean one thing- Spring is in the air! Homeowners are looking forward to enjoying time outside in the sunshine, and many may be eager to start a Lawn Care Program. However, the Lawn Care Experts at Giroud Tree and Lawn have been carefully planning the official start of the season, because this year a later start will yield better results after the wet winter. Winter weather can affect how a lawn fares in spring and summer, but carefully timing lawn care treatments can be the deciding factor between a lush, green carpet of grass and one riddled with problems all season long. Fertilizer and weed control are only effective if applied at the optimal time. The Philadelphia area has been enjoying the spring-like temperatures this week, but it’s important to know that air temperature is different than soil temperature. It takes a lot more energy for the soil to warm up, and the soil needs to be at optimal temperature to get the best results from the fertilizer treatments. Crabgrass Pre-emergent Control needs to be applied just as the Crabgrass is beginning to germinate, which won’t happen until the soil temperature is 55 degrees or above for at least 3 days in a row. 1. An Even, Uniform Application- excess water will dilute the product, causing some sections get too much and others not enough. 2. Maintaining the Product’s Strength and Effectiveness- wet conditions like these can dilute crabgrass controls and weaken the protective barrier. 3. Preventing Lawn Damage: If the ground is soft and still absorbing all that water, driving heavy equipment onto the grass will only damage the lawn! In some cases, the ground is still so soaked that even walking on it could leave divots and dents. 1. Give the property a Spring Cleanup! Clear brush, rake up leaves, and pick up anything that may block the early spring sun from shining down on those little grass sprouts. 2. Have the soil’s pH level checked. A balanced soil acidity will only strengthen the effectiveness of a lawn care program! 3. Schedule a Lawn Evaluation with a PA Certified Lawn Care Technician! A lawn expert will analyze the growing environment, the current condition of the lawn, and check for any emerging issues. 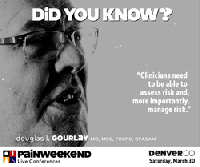 For more information about this or other regional conferences, and to register for 9, go to the PAINWeekEnd website. BONUS: PAINWeekEnd registrants may register for the 2019 PAINWeek National Conference, September 3-7, in Las Vegas, for 0 off the regular online published price. 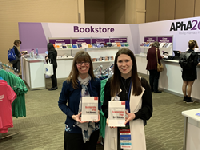 For the second consecutive year, Reminder Services, Inc. - a provider of automated communications for the healthcare industry - has awarded ,000 in scholarships to physical therapy students who exhibit academic excellence and a strong sense of personal commitment continue their education. Established in September 2017, the ReminderCall.com Physical Therapy Scholarship provides financial assistance to college sophomores, juniors, seniors or graduate students enrolled in an accredited physical therapy program for the 2018-19 academic year with a minimum cumulative GPA of 3.0. “I hope to be a teacher not only in the clinic, but someday also to future physical therapists. There are few things more important than passing a passion for service to others, particularly the future generations. I also want to contribute to or perhaps found a non-profit physical therapy service that is able to narrow the healthcare disparity I see every day,” said Meyer, a first-year graduate student. International Scholarship and Tuition Services, Inc. (ISTS), an independent scholarship management company, hosts the online application process, selects recipients and disburses awards for the program. Learn more at https://www.remindercall.com/physical-therapy-scholarship/. Columbus-based spa owner and beauty expert, Jaclyn Peresetsky, announced today that she is opening the first advanced esthetics school in the Midwest in March of 2019. Skin Perfect University is located at 725 Buckles Court, Gahanna, Ohio, 43230, by John Glenn Airport. It is poised to pick up where beauty schools leave off by offering a roster of advanced classes for accredited estheticians including makeup techniques, permanent makeup, chemical peels, dermaplaning, microdermabrasion, nutrition for skincare, microcurrent, nanocurrent, cryotherapy, ultrasound, radio frequency, color analysis, and much more. Estheticians can earn CEUs by attending classes at Skin Perfect University or take classes to advance their knowledge. Skin Perfect University will employ seven staff including esthetics instructors and ColoreMe Perfect Color Analysis Consultants. Peresetsky also owns Skin Perfect Image Wellness Spa and is the creator of the ColoreMe Perfect Color analysis process and cosmetics line, as well as the Skin Perfect skin care line. The grand opening party on March 22 will host licensed estheticians and spa owners who will hear from Jaclyn about the school, receive a facility tour, experience product and service demonstrations, and leave with a goodie bag. International industry publications including Skin, Inc. Magazine, Les Nouvelles Esthétiques & Spa Magazine, and Dermascope Magazine will also be in attendance. For more information, please visit http://www.SkinPerfectUniversity.com. Master esthetician, author, speaker, and noted color expert, Jaclyn Peresetsky, is the founder of Skin Perfect University, Skin Perfect Spas, ColoreMe Perfect Cosmetics and Analysis, and Skin Perfect Skin Care. You can usually find Jaclyn at one of her three Skin Perfect Spa locations, traveling to train spas on her cosmetics and skin care lines, speaking at an industry conference, or sharing beauty tips on television. The NAPCP will hold a two-day educational workshop, “Commercial Card Programme Management: Beyond the Basics,” on 12-13 June 2019, Inner Circle, Regent's Park, London, NWI 4NS. It is open to both industry end-users and providers. The workshop is geared towards programme managers interested in programme improvements and industry knowledge. A quick review of the basics brings beginners up to speed. The balance of the workshop goes in to depth, related to programme practices and procedures. During the workshop, you will participate in an interactive presentation and open discussion around program challenges and successes. 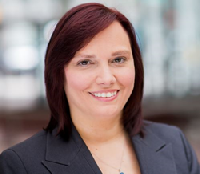 The workshop will be led by Heather Miller, CPCP, MBA, NAPCP Community Engagement Manager. The NAPCP is a global professional association that has been advancing the Commercial Card and Payment industry, which includes Purchasing Cards, Travel Cards, ePayables and more, since 1999. The organisation provides support for industry professionals who are enhancing Commercial Card and Payment programmes, developing policies and procedures, and seeking new products and technological advancements to create efficiencies. The NAPCP’s rich content, dedicated EMEA web portal, events, and virtual educational opportunities highlight the industry’s latest advancements, and help users build strong policies and procedures, meet regulatory requirements and achieve management buy-in. The NAPCP also seeks speakers and hosts for future events in the EMEA region. Review the organisation's year-round end-user speaking opportunities and submit a proposal today. To access the content and tools on the NAPCP's website, simply become a complimentary subscriber. The NAPCP is a membership-based professional association committed to advancing Commercial Card and Payment professionals and industry practices worldwide. Serving a community of more than 20,000, the NAPCP is a respected voice in the industry and an impartial resource for members at all experience levels in the public and private sectors. The NAPCP provides unmatched opportunities for continuing education and peer networking through its conferences, Regional Forums, webinars, website, virtual demonstrations, newsletters and regular communication. The association sponsors research and publishes timely and relevant white papers, survey results and other documents. The NAPCP also offers a (Certified Purchasing Card Professional (CPCP) credential. Premier Social Security Consulting will host its National Social Security Advisor (NSSA®) certificate education in six cities this year while expanding its webinar and on-demand courses for busy professional advisors nationwide. 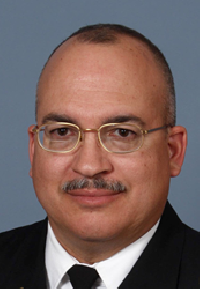 Marc Kiner, partner at Premier Social Security Consulting of Cincinnati, which teaches the Social Security education program, said professional advisors are busier than ever, but want the comprehensive NSSA program. NSSA is the nation’s only accredited Social Security education certificate program, with accreditation provided by the Institute for Credentialing Excellence (ICE) in Washington, D.C. The NSSA Advisor certificate is awarded to professional advisors who take the NSSA course and pass an assessment. The National Social Security Association has certified more than 1,700 advisors since the program began in 2013. 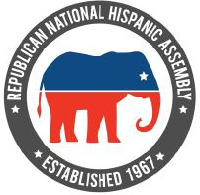 Full, all-day NSSA programming will be held in Cincinnati on Feb. 5, April 19, June 3 and 19, Aug. 15 and 16, Oct. 22 and Dec. 3; Orlando, Fla. on March 5; San Diego on March 28; Chicago on June 27; Cleveland on July 16; and New York on Sept. 23. Live Classes run from 8 a.m. to 4:30 p.m.
Webinars will be held on: Jan. 23; Feb. 14; March 12; April 5; May 3; June 18; July 23; Aug. 20; Oct. 17; Dec. 11; Dec. 27. Cost for the live class is 5, with web-based and on-demand video classes at 5. Premier also offers private, on-site classes for organizations that need to provide in-house Social Security training to multiple professional advisors. Eight continuing education credits are available for certified financial planners, certified public accountants, and insurance agents nationwide for live classes. Education credits will be also available for on-demand and web-based education in 2019. Premier provides ongoing gold standard Social Security education support after an NSSA education course is completed, said Kiner. Support includes monthly webinars; marketing videos; and a PowerPoint presentation. Premier is finding that more financial advisors are basing their practices on the needs of baby boomers, said Jim Blair, Premier partner and a Social Security expert. The Social Security topic, he added, has become an excellent lead generation tool. About 75 million Americans today are classified as baby boomers. A married couple can leave as much as 0,000 on the table in Social Security benefits by not accessing the program correctly based on their ages, health and life expectancy and not coordinating spousal benefits, said Kiner. For more information about the National Social Security Advisor certificate program, visit http://www.nationalsocialsecurityassociation.com or http://www.premiernssa.com or call Kiner at (513) 247-0526. Premier Social Security Consulting, LLC in Cincinnati educates professional advisors nationwide on the nation’s Social Security program so they can counsel their clients on how to maximize lifetime Social Security income. 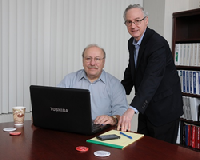 Partners Marc Kiner and Jim Blair teach the National Social Security Advisor (NSSA) certification program. After three vacationers went missing in Arizona, Trident University International (Trident) professor Dr. David Alegre was called upon to take part in a ground search and rescue assistance operation. Founded in 1998, Trident University International (Trident) is a leading online postsecondary university serving adult learners. Trident uses the EdActive™ learning approach, which employs case-based learning in an online setting to teach real-world relevant critical thinking skills to enhance the lives and careers of students. Trident offers high-quality associate’s, bachelor’s, master’s, and doctoral degree programs and certificates, led by a qualified faculty team, over 80% of whom have doctoral degrees. Trident is regionally accredited by the WASC Senior College and University Commission (WSCUC) and has over 27,000 alumni, including more than 22,000 with a military affiliation. The University has received multiple acknowledgements from Military Times and Military Advanced Education & Transition for their dedication to military-affiliated students. Visit http://www.trident.edu, Trident’s Facebook page, or call at (855) 290-0290 to learn more about Trident's wide range of educational options. Aladtec, a Wisconsin-based provider of cloud-based scheduling and workforce management software, will be among at least 100 exhibitors showcasing products and services to EMS professionals attending Wisconsin EMS Association's "Working Together" conference and expo, Jan. 16-20 at the Wisconsin Center. 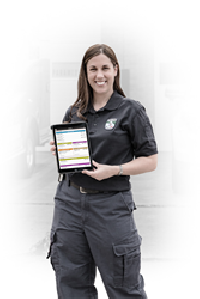 Nearly 900 EMS agencies nationwide use Aladtec to provide 24/7 staffing coverage and swiftly fill open shifts. The platform enables members to trade shifts, request time off, and log OT hours after the fact from a smartphone or other device. The program also includes a sophisticated form tool to speed up daily routines like rig- and med checks. Aladtec's cloud-based scheduling and workforce management software is used by more than 2,150 agencies across North America, including 138 EMS and fire departments in Wisconsin. “Before using Aladtec, I spent a lot of time dealing with trade requests from members. Now they take care of their own trades. It's also very easy to check the schedule from anywhere,” said Dale Dow, deputy chief with Fitch Rona Fire & EMS, which serves the Dane County (WI) communities of Fitchburg and Verona. “We'll never go back to paper scheduling." Watch a short video about how Aladtec's Forms tool can streamline inspection routines here. Account executive Joe Ellis, Sales Director Nate Davis, and Support Specialist Jake Tormoen will offer free demonstrations of the software and answer user questions about features, such as the new capability to attach and upload files within the Forms area. Aladtec staff will be at Booth #1020. Expo hours will be from 5-7 pm, Thursday; 11:15 am to 12:30 pm, and 1:45 to 3:30 pm, Friday; and 11:45 am to 1:45 pm on Saturday. Organizers declare WEMSA's show "the biggest Midwest fire and EMS expo." It's expected to include apparatus, airboats, helicopters, ambulances, safety gear, tools, and EMS and firefighting products. The WEMSA gathering offers EMTs, paramedics and agency leaders several days of continuing education sessions across the tracks of ALS, BLS, critical care, educator, leadership, management operations, community paramedicine, and special populations. Keynote speakers for the conference are Ashley Voss-Liebig, Division Chief, Emergency Services, for Travis County (TX) Starflight, and Eric Bauer, COO for FlightBridge ED, LLC. 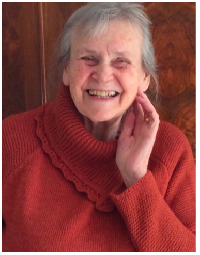 Following a stint in public affairs after college, Voss-Liebig served three years in the U.S. Army as a combat medic with the 101st Airborne. Upon discharge, she earned her BSN and worked five years as a critical care nurse before becoming a flight nurse. She joined Travis County Starflight as a flight nurse and rescue specialist in 2015. Voss-Liebig teaches and lectures around the world on a variety of topics, including provider wellness, team performance, and communication. See a brief lecture on caregiver response to stress that she delivered to emergency responders in London in 2016. Bauer has worked in EMS for 26 years, with the last 15 spent in helicopter EMS. He is an internationally recognized author, speaker, and educator. His firm is based in Scottsville, Kentucky. Other sessions available to attendees include topics like Sim Jim & The Barf Squad: Suction Science; Pediatric Nightmares and a Pediatric Airway Course; Car-Nage: The Kinematics of Trauma; Firefighter Down FDCPR; and How to Make Data Work for You, Not the Other Way Around. Attendees will have the chance to participate in a variety of hands-on training experiences including a cadaver lab to teach intubation and EMS officer training. For information about their affordable industry specific options, or to try a free demo, please visit http://www.aladtec.com. The Nation’s leading provider of regenerative medicine services, R3 Stem Cell, announced that registration is now open for the next physician stem cell therapy training course February 15th-16th 2019, in Las Vegas, Nevada. The course offers providers all the knowledge and procedure experience needed to successfully treat patients with regenerative therapies. Each provider receives a complimentary stem cell procedure! Call (844) GET-STEM or visit http://stemcelltrainingcourse.org to obtain more information and register. With over 10,000 successful stem cell procedures having been performed nationwide (and over 50,000 PRP procedures), R3 has been at the forefront of regenerative therapies with over fifteen current protocols, IRB approval, extensive safety record and millions of views on its YouTube channel. 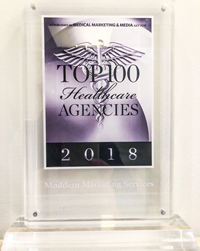 R3 works with its Centers of Excellence on sales and marketing efforts, Artifical Intelligence, patient procedures, data acquisition and first rate biologics. Feedback from the stem cell therapy training course has been remarkably high. Each attendee receives a stem cell procedure along with a facial rejuvenation procedure. Providers are then able to speak with patients more intelligently, having had a procedure done on themselves to relate to. The training course is broken up into one day of didactic sessions, which also include a real time facial rejuvenation procedure, and then the second day at a surgery center where procedures on real patients are performed. There are sessions on biologics, marketing, sales conversion role playing, supplements, image guidance, artificial intelligence and the intranasal technique as well. Providers have plenty of time to work on their ultrasound imaging techniques and network with the industry leading trainers. Each attendee receives a binder with all the presentations and procedure protocols along with a Completion Certificate. In addition to February 15th and 16th, 2019, the stem cell therapy training course is offered every two months. R3 Stem Cell offers a Partnership program for providers nationwide to assist with ongoing regenerative campaign efforts with protocols, the IRB inclusion, stem cell marketing and seminars. Visit the website for more information or simply call (844) GET-STEM for additional information! SubscriberWise, the nation’s largest issuing CRA for the communications industry and the leading protector of children victimized by identity fraud, announced today the planning and expectation for company founder and CEO David Howe to inform, educate, and empower Florida’s newly elected Attorney General Ashley Moody on complex civil theft scams exacted against Florida residents and visitors with frequency, ease, and impunity. “First, I’d like to publicly congratulate Ms. Ashley Moody on her election victory in the Sunshine State,” said David Howe, SubscriberWise founder and national child identity guardian. “Becoming Plant City’s highest elected official, as well as the state of Florida’s chief law enforcement officer, is quite an accomplishment and is certainly worthy of praise. “Second, and most important, I’d like to take this opportunity to introduce Ms. Moody to a subject that she will undoubtedly become intimately familiar as her official tenure in public office progresses. And that subject is the complex and highly refined ‘ding and dent’ scams perpetrated against unsuspecting and innocent consumers by the under-regulated car rental industry with stunning regularity. 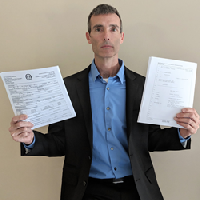 “Unfortunately, though, bringing an end to the complex money scams will be no easy task -- even for a dedicated and experienced legal professional like Ms. Moody,” Howe continued. “And that’s because the scams are indeed sophisticated and highly refined. So much so, in fact, that a cadre of sophisticated attorneys were able to dupe Lee County Judge Archie B. Hayward Jr. by suppressing an official police investigation -- including sworn witness testimony from the same individual who testified at trial after directing law enforcement to the wrong vehicle -- and directly contrary to Florida's 90.803 statute (Howe, David Edward Plaintiff vs Enterprise Holdings Inc, dba National Car Rental Defendant -- Case No: 18-SC-001768; http://www.leg.state.fl.us/statutes/index.cfm?App_mode=Display_Statute&URL=0000-0099/0090/Sections/0090.803.html). “The same can be said about the Lee Port Authority Police where a review of an official police investigation in conjunction with the official trial transcript reveals much more,” Howe added. “But it’s not all doom and gloom for truth and justice,” Howe emphasized. “Because thanks to Florida’s broad ‘Sunshine Law’ and ‘open government’ Ms. Moody will soon be empowered with what may be the most comprehensive and detailed evidence of criminal fraud and racketeering ever amassed in the United States of America. The mountain of evidence spans a multi-year period and is remarkable in scope with unimpeachable evidence of perjury, state statutory violations, and other due process debacles all contained on Florida official documents taken under-oath and available to all. “Yes, I’m certainly eager to make a formal introduction with AG Moody and I’m definitely prepared to enlighten her with overwhelming crime evidence. I simply have no doubt that she’ll address this racket with an unwavering conviction consistent with the upcoming oath and duty that she’ll swear in her official state capacity to protect her fellow FL citizens and visitors while enforcing the laws of the great state of Florida,” the child identity guardian concluded. Aussizz Group Dubai will now provide online coaching services for PTE-Academic. The news has brought cheer to aspirants who have struggling to get the right guidance for PTE-A. The PTE-A is an English proficiency test. A good score in PTE-A is essential for those who aspire to study, migrate or settle abroad. Aussizz Group is one of the pioneering names in the Immigration & Education Consulting Industry. The online coaching service will be available in two modes: Group & Personalised. An aspirant can avail any, after making a fair assessment of his/her current English skill level and learning needs. The online coaching service is a game-changer. It brings authentic preparation resources to aspirants' computer screens. Independent of their geographical location, they can access quality study materials, expert tutors, question banks, online PTE practice. Coaching for PTE-A will be provided by expert tutors at PTE Tutorials, the PTE education & training division of Aussizz Group. PTE Tutorials also connects with aspirants through its app for PTE preparation. 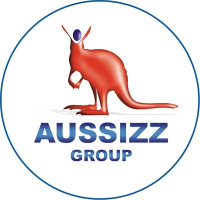 The development comes almost a year after Aussizz Group inaugurated its new branch in Dubai. The Dubai branch was then the 11th branch in the company's kitty. In the last one year, the company has opened eight more branches. This speaks volumes about its deep engagement with the community and quality services. "A common pain-point is that most aspirants can't devote enough time to prepare for PTE-A," said Mr. Dharmendra Patel, Managing Director at Aussizz Group. 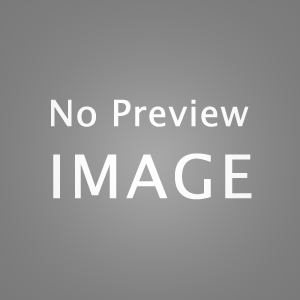 "This is owing to other academic/professional commitments. The online coaching service aims to plug that gap," he said. "We have received a great response for the online coaching service in Australia and India. In Dubai too, we are going to deliver the same top-notch quality education and training. Our goal is to ensure that the community in Dubai can be served in the best possible manner," Mr. Patel added. Established in 2009, Aussizz Group is one of the most trusted names offering quality immigration and education consultancy services. The team at Aussizz Group is accredited with many licenses and certifications including MARA (Migration Agents Registration Authority), MIA (Migration Institute of Australia) and QEAC (Qualified Education Agent Counsellor). Their expertise includes providing customised, tailor-made solutions in student visa, employer-sponsored visa, partner visa, business visa, visitor visa and GSM visa. The company also assists with professional year program, IELTS and PTE coaching and accommodation in Australia. Fins Attached, Marine Research and Conservation non-profit, is excited to announce a partnership with well-known Marine Biologist, Dr. Peter Klimley, a scientist known lovingly as Dr. Hammerhead. An educational marine biology course on sharks and rays will take place on Fins Attached expedition vessel, the Sharkwater in the Eastern Tropical Pacific in the summer of 2019. 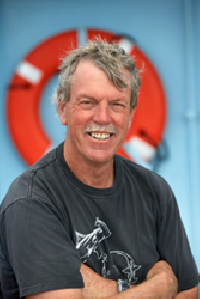 Dr. A. Peter Klimley has studied sharks for over three decades and has written over 60 scientific articles on the behavior and ecology of sharks and rays. The topics of his studies have ranged from the complex social habits and keen navigational abilities of hammerhead sharks to the feeding tactics and communication behavior of white sharks. Dr. Klimley realizes that the partnership with Fins Attached is an ideal way to help students learn about sharks and rays, studying in their natural habitat. "Although I am now retired from UC Davis, my passion for sharks and marine biology has not waned,” stated Dr. Klimley. “Partnering with Fins Attached is a way for me to continue to contribute to the study and conservation of sharks and rays." During his graduate career, he spent many a day free diving among hammerhead sharks, and placing electronic tags on sharks to follow their movements around a seamount and away into the surrounding depths. Dr. Klimley’s pioneering studies of sharks, which in a sense is a manual on how to study sharks, “Secret Life of Sharks,” is available for purchase on Amazon. Fins Attached has had a busy year since April 2017, when Fins Attached, acquired and launched the vessel Sharkwater, named after the documentary Sharkwater in honor of friend and award-winning filmmaker, the late Rob Stewart. Since then, the Sharkwater has hosted a few private research expeditions and even hosted the remaining Sharkwater filming crew to finish shooting Sharkwater Extinction. Hosting a college-level course on the Sharkwater vessel is a natural next step for Fins Attached. “We are very excited to have Dr. Klimley on board with us,” began Dr Alex Antoniou, founder of Fins Attached. “This will help fulfill a key mission for Fins Attached, to educate future marine scientist to ultimately help protect these vulnerable animals." Another Dr. Klimley book, “Biology of Sharks and Rays,” is also available for purchase on Amazon.com and it is the textbook for the upcoming course. If the public would like to learn more about marine conservation, visit finsattached.org. Dr. Klimley will be in attendance at the annual Fins Attached Gala in Denver on February 9, 2019. Donate today and help save ocean wildlife by contributing to the fight against sharks being mercilessly finned. Sharks play a vital role to the health of the marine environment, which ultimately affects all life on earth. To become a sponsor of the course and support marine biology students to enroll, contact info(at)finsattached.org. As Rob Stewart once put it, "Conservation is the preservation of human life on earth and that above all else is worth fighting for." Fins Attached conducts research, promotes conservation and provides education for the protection of marine ecosystems. Fins Attached believes in the preservation of our world's precious resources and that through the protection of the ocean's apex predators marine ecosystem balance can be maintained for the benefit of all living things on earth. Fins Attached is a 501(c)(3) non-profit organization. Visit finsattached.org, or email info(at)finsattached.org. studysharks.org. Tender Hearts School offers a highly conducive learning environment at all its branches for growing children. The teachers of the academy are regularly trained so that they are well-equipped to provide all the support students need to garner knowledge and become the responsible citizens of tomorrow. At Tender Hearts, some 5200 students have been trained for success till date across all the five branches in Patna. The Tender Hearts School community comprises over 2000 students, staff members and teachers. Over 15,000 parents have chosen Tender Hearts to empower their children academically. The philosophy of the founders is to impart knowledge and nurture values that can help develop social-emotional and intellectual skills in every child.The school makes use of proven scientific systems and contemporary techniques to develop the physical and mental abilities of students. The school has adapted a technology-driven approach and makes use of modern learning support mechanisms to deliver the best learning environment to all their students across all branches. The entire focus of the education methodology at Tender Hearts is to make the students of today mature and responsible citizens of tomorrow. Tender Hearts was launched in 2002 as a preschool. In the year 2013, the school started classes for primary students as well. The teaching methodology at this premier school involves a holistic approach, designed to be future-proof. Even the curriculum has been carefully designed to take care of the present and future needs of children.